They came to Washington, DC from 35 historically black colleges and universities across the nation, to demand of their congress people to provide more funding to their schools for campus improvements, more Pell Grants for students, and more federal research funding. went back to the nation’s capital for their Second Annual “Day of Action,” to make their case that lawmakers need to treat black institutions of higher learning the same as they treat their predominately-white counterparts – fairly. Among those speaking at the noon press conference on the steps of the U.S. Capitol, Dr. Paulette Dillard, interim President of Shaw University in Raleigh, and Matthew Collins, II, a junior at North Carolina Central University in Durham. 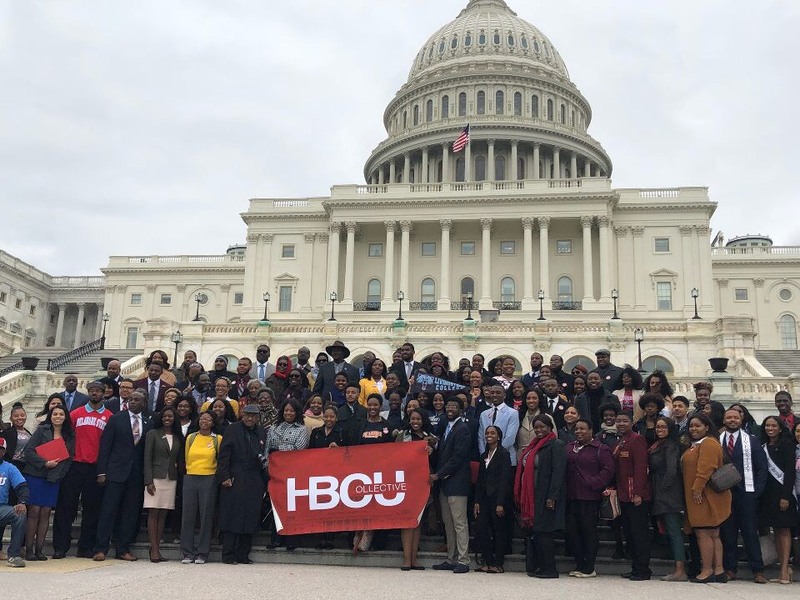 Shaw, the oldest HBCU in the country, sent at least thirty students to the “Day of Action.” Students from St. Augustine’s University in Raleigh, and other North Carolina HBCUs, attended as well. “These students here today are proof that in the 21stcentury, HBCUs will continue to play a vital role in educating the leaders of tomorrow,” Dr. Dillard concluded. Matthew Collins, II, a junior Mass Communications student at NCCU, told those gathered at the press conference that he chose NCCU “…for its diversity,” and was proud of the rich history of HBCUs. Though she was unable to attend the press conference, Rep. Alma Adams (D-NC-12), in a statement for the occasion, lauded the HBCU Collective, noting that in the recent 2018 Omnibus budget passed by Congress, HBCUs received significant support, thanks to their lobbying. “The voices of our HBCUs have helped us in the Congress change the conversation from “why do we need HBCUs” to “what would we ever do without them?” Rep. Adams stated. A veteran white NC Democratic congressman has been publicly accused of leaving a thirty-year legacy “…to little white children…,” by his African-American primary opponent, allegedly at the expense of the black constituents in his district he’s supposed to have served. 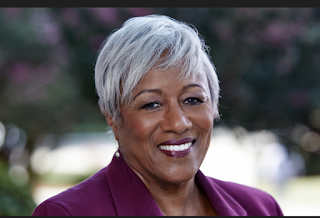 Of North Carolina’s thirteen congressional districts, only three are Democrat – Rep. G. K. Butterfield in the First; David Price in the Fourth; and Rep. Alma Adams in the Twelfth. Both reps. Adams and Price face primary opponents in the upcoming May 8thprimary – opponents who hope to unseat the district incumbent for a chance Nov. 6thto face the Republican challenger. And while Adams and Butterfield are the only two African-Americans in the NC Congressional delegation, Rev. Dr. Michelle Laws of Chapel Hill, former executive director of the NC NAACP, is vying hard to become the third. So much so that she’s taken off the gloves in going after Price, who has served in Congress representing North Carolina, for 29 years, accusing the Fourth District congressman of doing nothing for African-Americans during his tenure in Washington. The Fourth Congressional District encompasses parts of Wake, Durham and Orange counties, and is comprised of a sizable black voting population. “We are at a critical point in our history where we can’t be fearmongered and fooled into thinking that other people have our best interests at heart,” Rev. Laws said during last Saturday’s Raleigh-Apex NAACP Candidates Forum, where she and Rep. Price appeared. Like Congressman Price, Rev. Laws also focused on important local and national issues facing the Fourth District and the nation. But unlike Price, who noted the standard fare of affordable housing, jobs and education, in addition to getting Pres. Donald Trump out of office, Rev. Laws also focused on issues primarily affecting the black community – economic inequality, the school-to-prison pipeline, the need for criminal justice reform, among others, and she laid the blame for governmental inaction on those issues directly at Price’s feet. If anything, Rev. 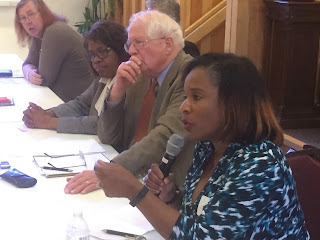 Laws was representing a growing, vocal youth discontent with what are seen as older, “establishment” Democrats like Congressman Price, who she alleged always come to the black community to speak at churches only at election time, and get select black spokespeople to reliably deliver the African-American vote, but rarely deliver on the election promises made. Laws made it clear that during her run for Congress, she was holding David Price both responsible, and accountable, for what she says are serious, festering problems in the black community per his district. “I’m not going to respond to accusations that have been thrown around today…’ Congressman Price said while giving his closing statement, “ later adding, “I’m not going to be accused of indifference..,” after countering that he did respond “immediately” after three Muslim students were gunned down in Chapel Hill a few years ago. [RALEIGH] The NC NAACP will hold a “FIVE” Rally on Monday, April 30th, 5:30 p.m. on the Halifax Mall behind the Legislature on Jones Street in downtown Raleigh. The rally will address fair courts, fair immigration, voting rights, veterans and education/economic/environmental justice and equality. For more information please go to www.naacpnc.org. [RALEIGH] By now you’ve noticed that gasoline prices have gone up dramatically in recent weeks. Prices to fillup your tank are the highest they’ve been in three years, with some parts of the country experiencing $4.00 per gallon gas. AAA of the Carolinas says gas prices here have gone up an average of $2.76 a gallon. AAA also notes that’s 20 cents more per gallon than a month ago, and 40 cents more per gallon that a year ago. [DURHAM] Former 2016 presidential candidate Sen. Bernie Sanders, and former president of the NCNAACP, Rev. Dr. William Barber, came together for a joint appearance at Duke Chapel last week, to call for economic justice, a “moral economy,” and an end to racism.” The two national leaders agreed that, especially during the age of Pres. Trump, fundamental changes are needed in the country if it is to survive as a truly just and constitutional nation. The event was postponed from Jan. 19thbecause Sen. Sanders had to stay in Washington for an important Senate vote.